Water Taxi Market size was valued at over USD 380.9 billion in 2017 and is estimated to exhibit 4% CAGR from 2018 to 2024. Rising travel and recreational activities owing to increasing disposable income across the globe are driving the industry growth. Water taxis offer various sightseeing opportunities such as riverfront tours, waterfront cruises, sunset cruises, and nature tours, further attracting the customers. Substantial improvement in the economic conditions has resulted in increased spending on leisure activities, further positively impacting the water taxi market share over the next seven years. The product facilitates faster river crossings that reduces overall travel time. Moreover, it also provides multiple benefits such as reduction in traffic congestion on roadways and quick ‘point to point’ transportation at fixed speed. They are also used for more economic passenger transportation as compared to other modes. These benefits will contribute significantly towards the revenue generation from water taxi market over the forecast timeframe. Rising prominence of green movement has resulted in significant demand for electric ferries. This can be attributed to various benefits offered such as reduction in human efforts, durability, and minimal noise & water pollution. 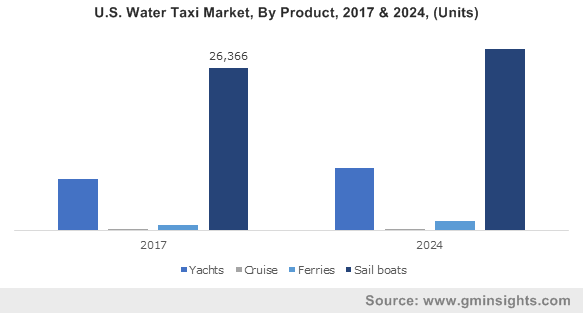 Industry participants are witnessing intense competition from substitutes such as roadways and railways, which will hamper the water taxi market growth over the coming years. High capital requirement & operational costs along with high fuel consumption are further posing challenge before the industry participants. Continuous advancements in technologies has led to increased preference towards transportation through water taxis. Autonomous water taxi is an emerging technology that has gained prominence in the industry. It is electrically powered by water energy and solar panels in their docking stations. They range from about 80 to 100 kms on water. Moreover, innovative usage of vessel tracking data from the U.S. Coast Guard’s Automatic Identification System (AIS) to measure ship dwell time is another industry trend that has resulted in high customer preference towards the product. These trends are anticipated to induce immense potential to the water taxi market size till 2024. Sail boats are likely to dominate the water taxi market with around 78% volume share by 2024. High production of sail boats essentially contributes to the high revenue generation. These boats are highly preferred over the counterparts for covering short distances. Cost effectiveness as compared to other boats will further support the industry dominance over the forecast timeframe. Water taxi market from ferries is anticipated to grow rapidly, exhibiting over 6% CAGR from 2018 to 2024. Substantial growth is credited to shifting preference owing to lesser travel rates as compared to cruise or yachts. Moreover, they are used dominantly for transportation of passengers for work purposes, unlike the counterparts that are only used for leisure activities. Continuously rising production of these ferries will further propel the industry growth. Water taxi market from diesel will account for highest volume share of more than 58% over the next seven years. Substantial production of diesel-driven boats will primarily contribute to the high revenue generation. Most water taxis across the globe work on diesel and it possess strong prevalence in the marine industry over the past decades, further supporting the industry dominance. Hybrid taxis will witness growth at over 5% from 2018 to 2024. This can be credited to numerous benefits offered such as lesser noise and water pollution than diesel. These advantages have resulted in shifting preference of manufacturers towards these boats over the diesel-driven taxis. 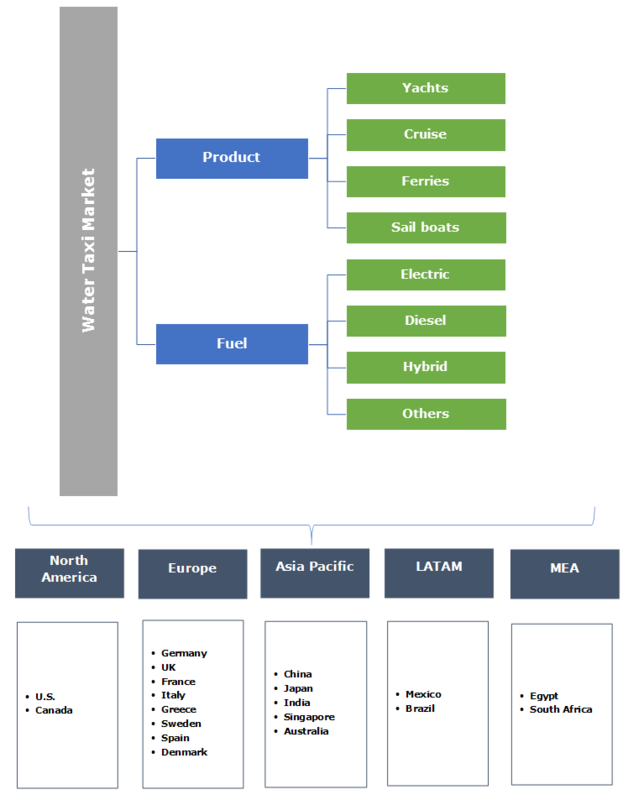 Moreover, rising penetration of green movement will further strengthen the penetration of hybrid boats, escalating the revenue generation of water taxi market till 2024. North America is likely to dominate the global water taxi market, accounting for over USD 287 billion by 2024. Substantial revenue generation is attributed to established marine industry along with rising number of industry participants such as American Sail Inc. and Brunswick across the region. Continuous growth in marine passenger traffic in the U.S. and Canada over the past years will further strengthen the industry growth. Increasing preference towards travel & tourism activities in the region will also support the regional dominance till 2024. Asia Pacific water taxi market is likely to grow substantially, exhibiting more than 5% CAGR from 2018 to 2024. It is attributed to rising production of these taxis across the region. Enhanced manufacturing facilities with availability of cheap labour will further contribute to the revenue generation. Rising preference towards marine transport owing to increased traffic congestion on roadways and railways is another factor positively impacting the water taxi market from Asia Pacific. Beneteau Group, Brunswick, Azimut-Benetti, Ferretti, and Sunseeker are among the noticeable participants in the water taxi market. Bavaria Yachtbau, American Sail Inc, Catalina Yachts, MacGregor, Hunter, and Princess are among other prominent industry players. The competitors are focusing towards regular innovations to enhance their visibility among the customers. They are highly involved in production of autonomous water taxis to gain competitive edge. Moreover, they are indulged in adopting marine hybrid propulsion, resulting in enhanced products with lesser marine pollution and compliance with the regulations associated with marine industry. Water taxis are used for marine transportation of passengers from one point to another, for short or longer distances. They are not subjected to any grid locks and traffic jams, unlike roads and rail transport. The industry participants are reviving the river transport system with modernization and expansion of fleet with economical and fast crafts. Further, the industry can be revived by initiating a private-public partnership in this sector and by launching mandatory training programs for river pilots and crew. These advancements will offer stable growth prospects to the water taxi market participants over the coming years.